The colony of Queensland established its own navy in the late nineteenth century because it felt threatened by a heavy Russian naval presence in the Pacific. The first couple of vessels were ordered from Newcastle-on-Tyne, and were designed especially to operate in the shallow waters of Moreton Bay. One of these ships was the Gayundah, an aboriginal word meaning "lightning" - no doubt because of her incredible 10.5 knot top speed. The Gayundah arrived here on 28 March 1885, and her presence can be felt yet. Here is a photograph of the ship in the Brisbane River in 1890. 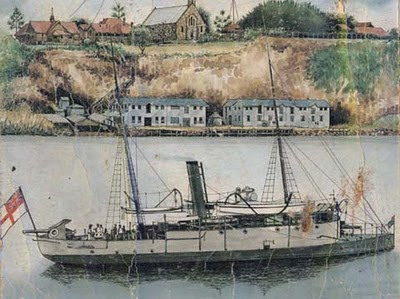 Here is another representation of her, this time moored near the Naval Stores at Kangaroo Point; St Mary's Anglican Church is at the top of the cliffs in the background. The Gayundah was heavily kitted out with guns, all the better to repel the enemy, but she was never required to perform those duties. In fact her first bit of action was a mutiny! Because of a pay dispute the man who commanded the vessel on the voyage to Australia, one Capt Henry Townley-Wright RN, was ordered to relinquish her to the ship's first lieutenant, but he refused. He moored Gayundah in the middle of the Brisbane River and threatened to sail her to Sydney. The stalemate was broken by Brisbane's police commissioner boarding the vessel and arresting Townley-Wright at gunpoint. In 1903, the first ship-to-shore radio transmission occurred in Australia. It was between the Gayundah and a radio station set up on the lawn of the church in the image above, St Mary's at Kangaroo Point. 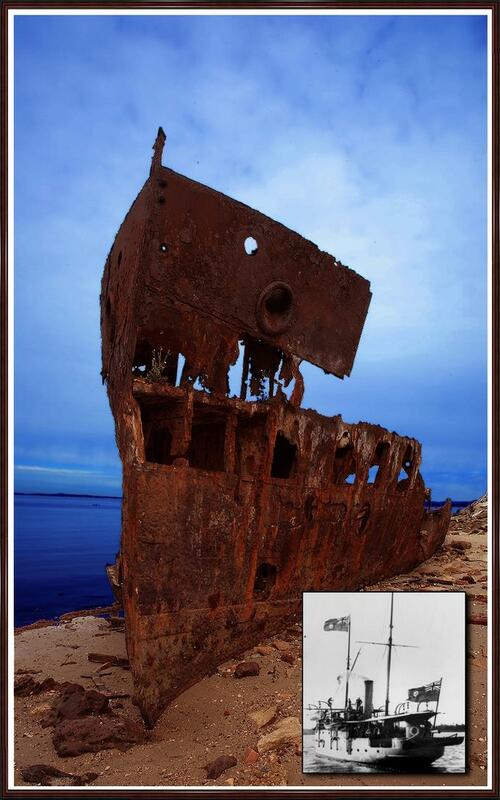 By this time the ship was part of the Australian Navy, having been seconded from Queensland after federation. 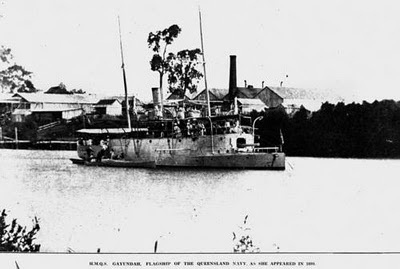 Gayundah continued to serve as a naval vessel, mainly for training purposes, in Queensland as well as other parts of Australia until 1918 when she was decommissioned. During WW1 Gayundah acted as a minesweeper and sea-going tender. In 1921 she was bought by Brisbane Gravel Pty Ltd and started her second career, this time as a sand and gravel barge. 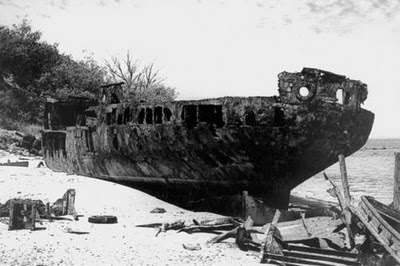 She sank at her moorings at Milton in 1930 but was refloated, and she lasted until 1958 when she was sold to the Redcliffe City Council. Then she was completely stripped and sailed to Woody Point where she was deliberately grounded to serve as a breakwater on 2nd June of that year. Here is a photo of her remains. The Gayundah is resting right across the road from another Brisbane landmark, the Palace Hotel, famous for hosting the Bee Gees' first regular gig. The hulk of the Gayundah remains at Woody Point, slowly submitting to rust. The name "Gayundah" lives on, too - one of Brisbane's cross-river ferries has been endowed with the name of this venerable vessel. When I was wandering around Queenscliff in Victoria, it struck me how much money and effort was spent building fortifications there. Apparently fears of invasion, particularly by the Russians who had been defeated in Crimea, lead directly to a tough and expensive Fort Queenscliff being commissioned in 1877, along with staff, guns, drill hall, barracks and a guard house. I was pretty much convinced that the Russians were not about to travel 15,000 ks to attack Victoria. Then I read that Queensland established its own navy in the late nineteenth century because it felt threatened by a heavy Russian naval presence in the Pacific!! What did Queenslanders think the Russians were here for? I understand that there was a feeling that Russia could declare ware on England, and that Australia was a valuable colony that could be invaded. Maybe it was just bogeyman stuff - I think the French were under general suspicion too. I can't help but feel sad for the old girl left to rust after her interesting life. How is your army nephew going? He just had his march out from Singleton (special weapons training) on Friday. As from tomorrow he is posted to 1RAR in Townsville. After that, potential overseas (eg Afghanistan) deployment. Although I am extremely proud of him, I (and the whole family) feel nervous about the future.